We had a brush with fame last weekend. I've mentioned before how much I loved old car-themed movies and TV shows like The Dukes of Hazzard. Well, those shows were more than just the cars--someone had to drive them. 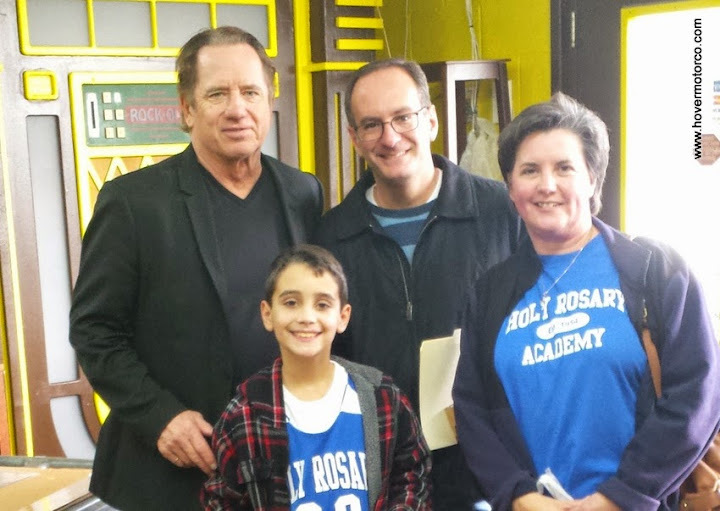 BHo and I were really excited to hear that Tom Wopat would be at Cooter's Place in Nashville signing autographs. Naturally, I forced everyone to stand in an hour-and-a-half line to meet Luke Duke. We met people that were more obsessed with the show than me. All-in-all, I'd say it was a pretty fun day. Christmas and cars. Now there are two things that really go together. Well, they go together for me anyway. I don’t think I’ve ever had a Christmas where I didn’t get at least something car-related. And apparently, they go together for car manufacturers too. 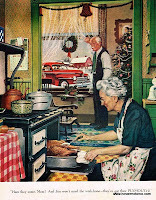 I can prove that claim by looking back at all the Christmas-themed automotive advertisements that have graced the pages of magazines over the years. 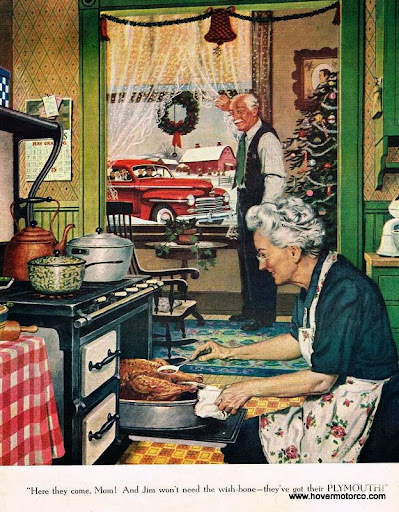 Of course, most of them are from a time when it wasn’t forbidden to mention Christmas in a main-stream advertisement. So that’s been awhile. But it’s still fun to look back on some of the stuff they used to print. Who wouldn’t want a new Packard under the tree?! As an automotive aficionado, I know there are some great car shows, car cruises, car races, car auctions, and swap meets here in the Nashville area. As a fairly new resident, I’ve had a hard time finding these events, though. When I lived in Kansas City, I spent a lot of time putting together a weekly calendar of events. It was great for me, because I knew where to go every weekend, but I often had people tell me they appreciated it too. I’d like to do something like that now that I’ve moved to Nashville as well. But instead of doing a new calendar every week, I’m just going to post this schedule that covers all of 2015, and update it as we go. So here it is. If you know of a Nashville-area car event that needs to be on here, feel free to e-mail me the details and I will add it if I can. I need the date, name of event, location with address, time, contact information, and anything else that’s important. Send that information to craig@hovermotorco.com, and I’ll do my best to include it here. Also, if you’re going to attend one of these events, it’s always best to call or check ahead. And with that, I hope you enjoy the 2015 Nashville-area car events schedule below. As the weather gets colder, new car show season is heating up. The Nashville International Auto Show was this weekend at the Music City Center, and spectators got a chance to enjoy the heart of the auto industry in the heart of country music. This wasn’t a particularly large auto show (weird that Cadillac didn’t have a display in Johnny Cash’s hometown), but it sure brought out a lot of people. There were so many folks looking at the cars that taking pictures proved to be very difficult. I still managed to click off a few of my favorites, though. Let’s take a look. “This can’t be right,” I thought as the GPS sent me to a crusty old office building on Memorial Boulevard in Murfreesboro. According to their website, Vintage Vettes handles a large assortment of pristine straight-axle Corvettes. Even as I went behind the building and opened the steel door, I did not see how this dark, dismal place could be what I was looking for. I introduced myself to a couple of guys sitting at desks plugging away on their computers, and they welcomed me to take a look in the next room. Suddenly I realized that my initial impressions were way off. Now I’m starting to feel a little sad. The first car cruise that I went to when I moved to Nashville was the first cruise of 2014 at Coach’s Eastgate Grille in Lebanon, Tenn. And now, it looks like one of the last cruises of the year that I’ll be going to is, you guessed it, the one at Coach’s Eastgate Grille. These guys started the season early, and are ending the season late. Plus, they do a good job with this event, offering door prizes and even lunch to participants. This is a pretty good way to end things. That’s especially true when you see what kind of cars they had on display. I obviously go to a ton of car shows, so I get to see a bunch of great cars. But sometimes, the most interesting old cars that I see are someplace other than car shows. I’m talking about collector car auctions. If there’s one anywhere near me, I’ll always try and hit it. You know cars are often at their best when someone is trying to sell them. No questionable personalization. No door prizes. No disk jockeys. What you get is a straightforward variety of cars, all cleaned up and presented in a way that should appeal to the greatest number of buyers. Take a look at some of the cars that were at the Music City Fall Classic Auction in Murfreesboro and see what I mean. Mt. Juliet was a scary place last Saturday night when the annual Trunk-or-Treat Car Cruise rolled into the Chick-fil-A parking lot. Vintage cars were mixed with scary costumes for a fun night of candy and chicken. This was the first time since we moved here that the old HMC truck was able to wear its Halloween costume (Tow Mater, every year, of course), but there were lots of other great cars and trucks to check out along the way. Here were a few of my favorites. Over the weekend, I found my way all the way down in Spring Hill, former home of the Saturn, for the Cruisin’ Spring Hill Drive-In Car Show. Now, the General Motors plant in Spring Hill might not build Saturns anymore, but they’re definitely alive and kicking, and still churning out Chevrolet Equinoxes. This event was held at the UAW 1953 Union Hall, and featured this car show along with GM displays, a craft show, live music, and even food trucks. It was actually quite a shindig. Here are some of the cars. The Nashville Fairgrounds was a busy place over the weekend. On one side of the parking lot, there was a stereo competition. But since the stock Delco in my wife’s 2007 Impala didn’t crank out enough base to put it in contention, we went to the other side of the lot and checked out all the great vintage cars at the Nashville Classic Collector Car Auction. There were a bunch of people in there with bidder numbers, as it should be. The guys from JMARK Classic Car Auctions, and auctioneer Phillip Traylor, were running a small but high-quality lineup of hot rods, muscle cars, and classics. Yee haw! As a car chase-loving boy growing up in the ‘80s, The Dukes of Hazzard was one of the greatest TV shows in the history of the world. I still watch the show today with my own son, and it still brings back some nice memories. And I’m not alone. There are still die-hard Dukes fanatics out there. Some are even more into it than me, including the ones participating in the Hazzard Run over the weekend. These guys and gals gathered behind Cooter’s Place in Nashville with their very own General Lees and Hazzard Sheriff’s cars, and caravanned down to Cooter’s Place in Gatlinburg. There. They met up with actual cast members from the show. It seemed like a good time to me, so we got up early Saturday morning to see them off. The picturesque Fontanel in Whites Creek has become a family favorite of ours, and the Thursday night cruise is one of the best around. The event flyer made it seem like last Thursday was the last one of the year, so we made a quick stop over there to have some dinner and check out the cool rides. Luckily, it sounds like they might have a few more car events at Barbara Mandrell’s old mansion, so we may just get to come back out here while the leaves are changing. But for now, let’s take a look at the nice stuff that was there while the sun went down. A couple weeks ago, the Greaserama car show was held in Kansas City. I had attended most of them, and was feeling bad that there wasn’t something like it here in my new home of Nashville. Several people told me that I needed to check out the Redneck Rumble in Lebanon, Tenn. They assured me that it would fill that void. So off we went this weekend to the birthplace of Cracker Barrel to check out what turned out to be a humongous gathering of rat rods and other stuff. So big was this event that I had trouble even remembering which rows I had been down. Between the cars and the swap meet, I didn’t know what to look at next. Many years ago my dad and I stopped in at the Country Music Hall of Fame (CMHOF) during one of our visits to the Nashville Fairgrounds Speedway. I remember that it was a nice little place packed with memorabilia, and a car or two on display for good measure. Since then, they’ve built a new, 350,000-sq/ft. Hall of Fame, with more rhinestones, banjos, and vintage steel guitars than you’ll ever see in one place again. As you probably have guessed, there are also a few country music-related cars in there. That’s Alan Jackson’s ’55 Thunderbird in the picture. Of course you want to see the other cars, so here we go. When you want to visit a really touristy, Nashville location, the Music Valley area is a good place to stop. This is near everything from the Opryland Mall, to Cooter’s Place, to the Opryland Hotel, to go-kart racing, to any number of bars and restaurants. While we were there, we went in to eat at the Nashville Palace, which is about as representative of Nashville as any place we’ve visited since we’ve been here. We watched John England and the Western Swingers. They were a little group of country musicians that all had incredibly impressive resumes. They were great. Oh, and the cars were too. As I was pulling into the neighborhood to check out the 2nd-Annual Old Skool and New Kool Car Show at the Life Church/Broadmoor Family Worship Center, the rains came. I don’t mean a light shower or sprinkle, either. This was a deluge. I could barely see two inches in front of my face, not much less get out and take pictures of all the old cars that were sinking in the grass. But the thing about Tennessee rain showers is, once they do what they’re going to do, they’re done. It didn’t take long for the faucet to shut off, the sun to come out, and the car show to resume. For car aficionados, Bowling Green, Ky., is known for the National Corvette Museum and the Bowling Green Corvette Assembly Plant. But if you can divert your gaze away from the museum for a moment, you may notice Art’s Corvettes, a classic car dealership that’s located right across the street. The location and name of this place might fool you, because there is a lot more here than just Corvettes. Art’s is an equal opportunity old car peddler, featuring everything from Chevys to Fords. I took a look inside the other day, and here’s some of the good stuff. If you wanted to see some of the nicest cars in the Music City last Saturday, you needed to be at the O’More College of Design for the Touch of Gold Fall Open Car Show. This was a great location, with plenty of shade trees, food vendors, and a bake sale. I was having trouble figuring out why it was so hot and humid in the shade, though. I wonder if they can air condition the campus next time. Oh, well. The cars almost made up for it. Sit there at your air conditioned desk and check them out. It seems like lately everyone knows about the National Corvette Museum in Bowling Green, Ky. Well, they know a sinkhole opened up under the fancy yellow dome and snarfed down eight Corvettes that were on display. I even wrote a feature about it not too long ago. What people might not realize is that this is the 20th anniversary of the National Corvette Museum, or that they just opened up a brand new road course next to the property. They should know it after this weekend, though, because the National Corvette Caravan hit town, bringing some 5,000 fiberglass two-seaters from all over North America. I hate to make excuses, but there has been so much going on the past week that I’m behind on my blogging. Take this coverage of the Chick-fil-A Cruise in Mt. Juliet. I actually took all these pictures more than a week ago. But even though it has taken way too long for me to hammer out a story, I think you’ll agree that it was worth the wait. This was a nice cruise with some nice cars on a nice night. And who doesn’t enjoy a delicious Chick-fil-A chicken sandwich while they’re surrounded by hot rods? Let’s take a look. One of the events that I knew I was really going to miss when I moved from Kansas City to Nashville was the Midwest All-Truck Nationals. As an old truck owner, I always enjoyed the all-truck format, and the people that own old trucks tend to be fun to hang out with. My fears were put to rest this weekend when I drove my old heap to White House, Tenn., for the Southeastern Truck Nationals. This all-General Motors event had a lot of what I liked about the KC show, and I got to see a bunch of new (to me) trucks at a very nice city park. The skies were a little overcast, but that didn’t keep 85 trucks from making the show. The Wienermobile. Just the name strikes fear in those that hear it. This 14,000-lb leviathan prowls the highways, back roads, and supermarket parking lots searching for innocent victims to torture with tiny Wienerwhistles. Actually, it might be the parents of those who receive the Wienerwhistles who are tortured. 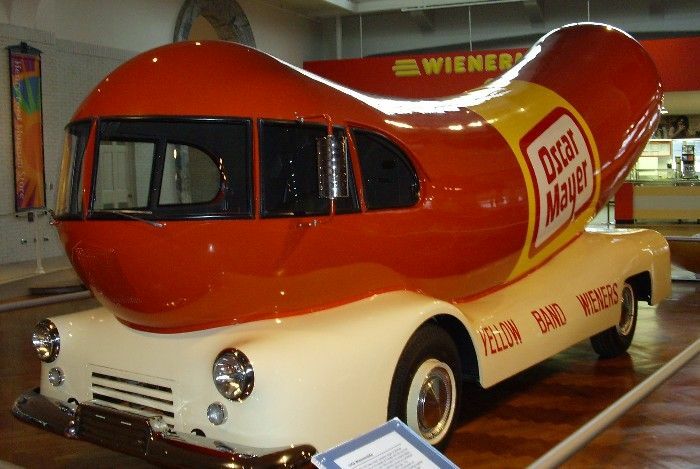 At any rate, the Wienermobile is easily the most recognized promotional vehicle ever hit America's highways. And since it's the Fourth of July, a holiday that revolves around the consumption of hot dogs, I thought it would be a good idea to look back at the history of this iconic rolling billboard. Saturday night means cruise night in Goodlettsville, so BHo and I jumped in the ol’ ’63 Chevy pickup and headed out. This was kind of a landmark event for us, because it was the first time since we moved to Tennessee that the truck has made it to a car show. I’m not sure that it really wowed the crowds or anything, but it was a significant point for me. I had a good time taking my son out to this event. It was a good night to enjoy each other’s company in the presence of a lot full of nice cars. Once a month, there is a big flea market at the Nashville Fairgrounds. We went to that on Saturday, and it really is enormous. But just as we thought we couldn’t take another step, it was time to pass through the gate of the Fairgrounds Speedway Nashville, where they were holding Auto Fair, a car show, swap meet, and track day for local enthusiasts. Morning rains and hot, humid conditions probably kept some participants at home, but those that were there seemed to be having a good time in the pits of the historic speed plant. Normally I go out of my way to find car events, but sometimes I find them by accident. Such was the case Saturday night when we went to see How to Train Your Dragon 2 in Mt. Juliet, Tenn., and just happened upon the Mt. Juliet Cruise-In in the Chick-fil-A parking lot. I do like going to the movies, but when I get to see a car show before I go into the movie theatre, well, that’s pretty hard to beat. And although this wasn’t the biggest event I’ve been to, the quality made up for the quantity. Here’s some of the good stuff. It’s summertime in Nashville, and that means the Fontanel Mansion holds their classic car cruise every Thursday night in Whites Creek. This week, the featured club was the Mid-Tenn Classic ’55-’56-’57 Chevy Club. So after a nice Italian dinner and live music at Café Fontanella, we walked outside for more live music and a neat collection of cars highlighted by shoebox Chevys. This is one of the more picturesque places for a car gathering. Normal people would probably be happy coming out here without the cars even. But I’m not a normal person. Let’s check out the cars! Check this out. I’ve been a Nashvillian long enough now that I’m actually starting to hit some of the car stuff for the second time. Friday night, it was a repeat visit to the Hendersonville Cruise, where I got to see a bunch of different cars that I hadn’t seen before. This is a pretty big event, and organizers try hard to make this a fun, family get-together. Door prizes and kids dancing to the Hokey Pokey are all pretty nice perks, but as you know, I’m there for the cars. Let’s take a look at some of the standouts. A couple of weekends ago, I was able to get back to Kansas City. Whenever I do that, I like to try and hit a car place or two. One of my favorites has always been Wagner’s Classic Auto in Bonner Springs, Kan. Yes, this is a dealership, and their primary function is to sell cars. But the inventory seems to change every time I go there, and the quality of cars on display often surpasses most car shows I go to. I always enjoy going there. Let’s look at some of the cars and maybe you’ll see why. On July 2, 1953, Edward Lamb from Greenville, Tenn., walked into Green County Motor Company with a used car trade-in and $627 cash, and drove away with a brand-new Ford Customline Fordor. Edward’s Glacier Blue sedan may not have been the flashiest car on the block, but it commemorated Ford’s 50th-Anniversary. Today, 61 years later, this amazing time capsule has only amassed 31,000 actual miles. From top to bottom, this car is pristine, untouched, and absolutely original. It may be the nicest, most honest old car I have ever seen. McPherson College in McPherson, Kan., is well-known for their automotive restoration program. So it stands to reason that they would have an extracurricular club devoted to the subject. For the past 15 years, C.A.R.S. (College Automotive Restoration Students) has put together a big car show at McPherson College that brings together an exceptional collection of cars from throughout the Midwest. This year, my mom and dad met up with our good friend from Colorado Pat Casey to check out all the happenings. Pat was kind enough to send some pictures to share with HMC readers. If you’re a regular here, you know that I’ve taken you to major automotive museums from California to Michigan. But in 28 years of living in Kansas City, I was never able to show you a public car museum that wasn’t in business to sell cars. That changes right now, with the opening of the Kansas City Automotive Museum in Olathe. This isn’t a huge museum, but it has some high-quality cars and interesting Kansas City automotive history. And as nice as this place is, it’s just a start. They’ll continue to refine and improve this location until they move into a larger facility sometime in the near future. My family is in the final stages of our transition from Kansas City to Nashville, and I was back in KC over the weekend to meet up with family and friends. I also managed to take in a car activity or two, including the Longbranch Cruise in Overland Park on Friday night. They’ve usually got some nice stuff at this one, and since I haven’t been in town since the beginning of car cruise season, much of it was new to me. One of the things I’m going to miss about Kansas City is the collection of exceptionally nice cars out there. Here are a few examples. When you come to this website, you probably expect to see big ‘50s cars, Corvettes, Kustoms, hot rods, and muscle cars. You will see none of those in this story. Today we’re visiting the Lane Motor Museum in Nashville, Tenn. This 132,000 sq.-ft. facility was formerly a Sunbeam bakery, but today houses more than 330 mostly vintage European cars from the private collection of Jeff Lane. But these aren’t the typical Mercedes, Porsches, and Ferraris that you might expect. The Lane Museum contains an eclectic mix of microcars and Communist dictator limousines. If it’s quirky and interesting, you’ll probably find it here. Let’s take a tour. Ever since I moved to Nashville and people learned that I write about car shows, everyone has asked me if I would be going to the Goodguys Nashville Nationals. Well, of course I went there. Casual car lovers and out-and-out fanatics all make it to this 2,000-car extravaganza held in the Tennessee Titan Stadium parking lot. And maybe the best part of it is that you are surrounded by Nashville’s impressive downtown skyline. This is a cool place for this event, and this is by far the best car show I’ve been to in the Music City so far. Every other Sunday, there’s a really small car cruise in Nashville, but the location is cool enough that it should be bigger. It take place at the Marathon Village. And if you like cars or antiques, this is a place you need to check out. 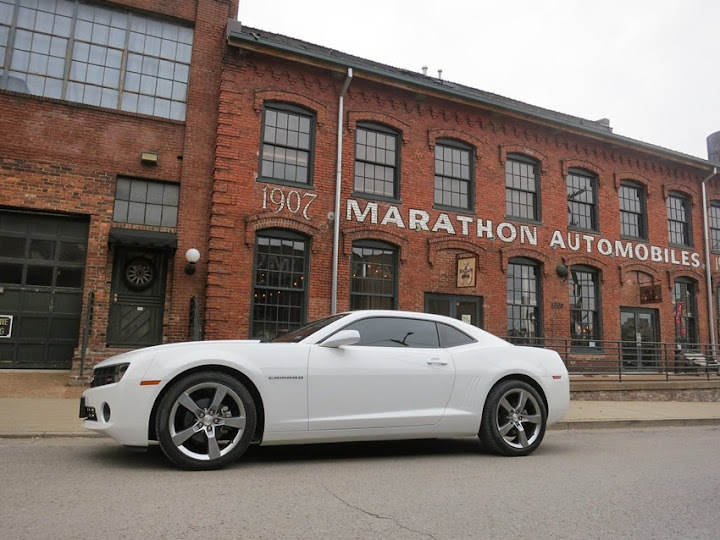 You see, Marathon Village is actually an old factory that built a car called the Marathon from 1907 to 1914. It’s also the site of Antique Archaeology, which is the store Featured on American Pickers on the History Channel. Add all the little shops and the overwhelming sense of history, and you have a must-attend event. The big car event in Nashville last Thursday night was the weekly cruise at the Fontanel Mansion. Like most of these places, I had never been there before, and didn’t really know what to expect. What I found was one of the coolest places to have a car event I’ve been to in a long time. The Fontanel was originally Barbara Mandrel’s 27,000 square-foot log home, but now it’s used for private events. There are zip lines, restaurants, an amphitheatre, the world’s only Goo Goo Clusters store, and much more. And everything is surrounded by rolling hills, lush grass, and green trees. It’s really pretty out there. Saturday night I decided to forego the bigger, closer cruises in the Nashville area to try out one I hadn’t been to yet. This was the Fairview Cruise in the Tractor Supply parking lot there. They had a few nice cars, but honestly, there were not very many there to look at. I don’t regret going, though, because I drove through some very nice scenery to get there from my home base in Old Hickory. Plus, you know I’m always game to see cars I’ve never looked at before. It was a bit of a drive, but I can think of worse things to do on a Saturday night. For most people, Spring Hill, Tenn., is famous for one car—Saturn. Back in the day, the state-of-the-art assembly plant in Spring Hill cranked out hundreds of thousands of these plastic-paneled eco-mobiles to what was at the time a rabid fan base. There were people out there who loved these cars. They loved the no-haggle pricing strategy. They lovd being part of the Saturn family. Don’t believe it? Back in the 1990s, as many as 50,000 Saturn owners and lovers would converge on Spring Hill for the annual Saturn Homecoming shows. No matter where you go in the United States, people who love cars will find a way to get together. Take Goodlettsville, Tenn. Every Saturday night throughout the summer, a big group of car nuts meet up at the Goodlettsville Cruise, which takes place behind the Publix grocery store. And true to form, when you get this many cars together, you’re bound to see some good ones. Let’s take a look at a few of them that stood out. Gallatin, Tenn., is a quaint little city with an historic downtown area. And every April they close that area down for their annual Square Fest celebration. Their website says there are crafts, food vendors, and live entertainment. I’ll have to take their word for it, because I never actually got to the main area. I was too distracted with the Gallatin Square Fest Car Show, which took place in a couple of parking lots near the center of the action. I think you’ll see why, though, because there were some pretty nice rides out there.